In August of 1980 we opened our first location in Louisiana. Now we are proud to serve thousands of new and renewal clients every year. We now have three locations on the NorthShore. At the touch of a button we can give our customers our best possible quote for their automobile, boat, motorcycle, RV, mobile home or business from several top rated insurance companies. Our clients can shop for several top rated companies such as Progressive, Imperial Fire & Casualty, Unitrin, AIG, Safeway and many other well established insurers. All of our agents are Property & Casualty licensed and trained to handle all of your insurance needs. In this day and age you have to get the best, honest and dependable agent to insure the job is done properly and at the lowest possible rate. Nothing is as important to us as our clients, without them we would not be here. This is represented in the way each and every insured is handled; with honesty and their interest at heart. Our agents will sometimes go overboard in making sure you truly understand what you are getting with your policy, whether a personal auto, motorcycle, boat, mobile home or flood policy. Being able to offer so many different companies enables us to give our clients the best possible rate and company for their money. We depend on our customers for our growth and good name. 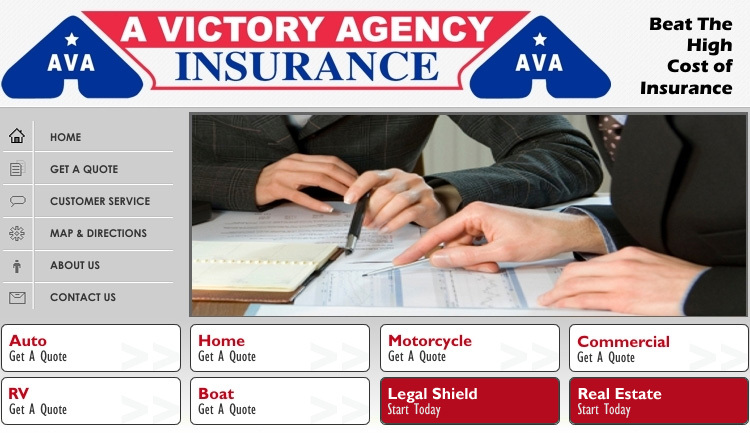 Copyright © A VICTORY AGENCY INSURANCE - all rights reserved.